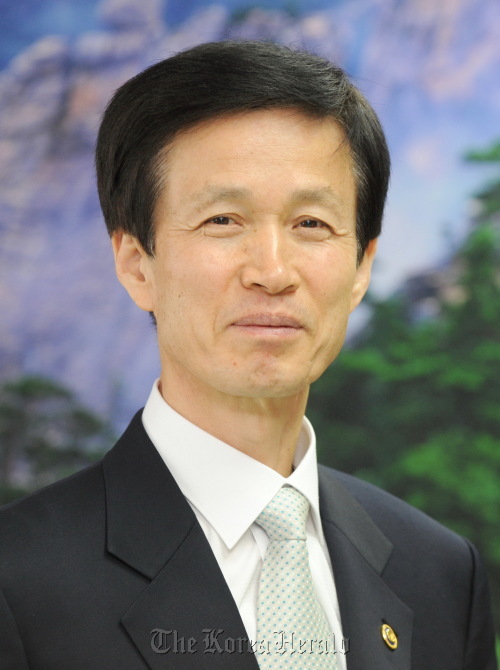 Korea Forest Service Minister Lee Don-koo has been working toward a greener global environment since he took office in February. The agreement to set up the Asia Forest Cooperation Organization with ASEAN member states is the latest in his efforts to combat desertification and push for green growth. He also successfully proposed the Changwon Initiative ― which seeks to provide practical measures to tackle desertification ― at the U.N. Convention to Combat Desertification conference in Korea in October. The following are excerpts of Minister Lee’s interview with the Korea Herald. Q: What significance does the agreement on Korea-ASEAN Asian Forest Cooperation Organization have? A: The agreement has two meanings. First it is a concrete outcome of the government’s past efforts under its “low-carbon, green growth” policy. President Lee Myeong-bak suggested launching the organization at the Korea-ASEAN Commemorative Summit in 2009 to cope with climate change. Leaders of member states who attended the conference also said it was a good start to achieving “low-carbon, green growth.” Secondly, the Korean government established an inter-governmental network in the forestry sector. The pact will become a window to discuss general issues in forestry. Q: What economic benefits does the AFoCO have? A: Countries are now not just pressuring but forcing developed nations to reduce carbon emissions. Korea is categorized as a developing country, exempted from such responsibility. But the government made an announcement that it would cut its emission rate by 30 percent (from projected levels) by 2020. The project to reduce carbon emissions, by restoring and preventing any damage to forests, is likely to be more efficient in tropical regions than in Korea. The international society is collecting resources to cut greenhouse-gas emissions through U.N. Collaborative Program on Reducing Emission from Deforestation and Forest Degradation in Developing Countries, along with the World Bank Forest Carbon Partnership Facility. For example, developed nations pledged to aid the REDD+ by saving $4 billion as a public resource. Japan also vowed to contribute $5 billion by 2012. In the competition to secure carbon emissions rights, there is a need for Korea to gain REDD+ based carbon emission rights. This is relatively inexpensive and it certainly will be instrumental in strengthening the competitiveness of Korean companies. The trend is moving toward aiding pilot projects in developing countries or organizations launching projects in those countries by themselves; which are both to ensure carbon emission rights. The size of forestry-related financial support to Indonesia is $1 billion, $2 billion and $3 billion from Norway, Japan and Australia respectively. If Korea starts to be categorized as a developed country, and obliged to reduce carbon emissions, it needs to prepare sustainable development at the industry level. Carbon emission rights, usually produced by the REDD, were $5-10 per ton of carbon dioxide in 2009. This is relatively inexpensive compared to the EU Emission Trading Scheme, the carbon emission rights exchanged in Europe. Eventually, Korea will need to fortify its relationship with countries associated with the REDD+ using the AFoCO. Q: What are the details of the agreement and what are the plans for the future? First, afforestation and reforestation, restoring damaged land, environmental service, community forestry, REDD+ and other measures to cope with climate change. Second, biodiversity and ecotourism. Third, non-wooden forest products and renewable bioenergy. Fourth, training human resources including degree courses. All four are crucial agenda in the forestry area and are pressing issues for developing nations. We pushed nine projects this year which amount to $1 million in total. The KFS reflected all those issues in the mentioned projects. Right now we are planning to enlarge this size by setting $2 million as our budget. The projects will grow even bigger if we add human resource training programs, including providing degree courses. Programs that help domestic researchers who study local areas are also being prepared. Q: How will the working-level office in Korea be operated? A: The office is to be set up in Korea. Based on business cooperation in forestry, professionals and trained negotiators will be committed to take part in any future projects of the AFoCO. We are reviewing candidates for secretary-general, selecting who is well-aware of and has experience of dealing with regional issues. Dispatching professionals from member countries, if needed, is also being considered as well as having frequent meetings with the board of directors. In this regard, we are planning workshops for each category of the AFoCO and workshops on regional affairs. Aside from the working-level office in Korea, regional centers will be established to handle local matters efficiently. Korea will cover most of the cost of running the office in Korea, but member countries agreed on sharing the cost of future projects and business. We will not only work together with member countries but international organizations and NGOs as well. Q: Tell us about the vision that the KFS has on global forestry cooperation. A: The achievements that Korea has made in afforestation are widely recognized by global society. Like I said, the president of Indonesia, Susilo Bambang Yudhoyono, spent a lot of time in his speech stressing Korea’s successful implementation of afforestation. Traditionally, countries that manage to cultivate their forests well have been economically powerful. And Korea was able to restore the ruined and deserted land here. The KFS hopes to make this know-how a “global product” by passing it on to the world. Q: Tell us about the signing ceremony of cooperation agreement you had in Bali. A: After President Lee Myung-bak suggested the AFoCO, the KFS has been on its feet the last two years to conduct successful negotiations. International cooperation requires forming a bond. We tried very hard to earn their trust by listening to them in difficult times. Domestic and foreigner negotiation experts were hired to learn the skills and prepare for every little detail in dealing with governments and organizations. We were also in cooperation with the Ministry of Foreign Affairs and Trade from the beginning of the project, for it is impossible to establish an international organization relying on technical skills. This is a collaboration of the academic world, NGOs, state-run organizations and diplomatic offices abroad. At the later part of the negotiation, we held a group meeting every month with the participation of 11 countries. We also learned a lot from this. Looking at foreign ministers signing onto the agreement in Bali, pictures of all our hard efforts appeared my head. I will prepare step by step, always reminding myself that it’s a start.